Pittsburgh Magician, 4 time winner of PITTSBURGH'S MAGICIAN OF THE YEAR. Carries $1 million dollar liability insurance coverage. Available for all events: birthdays, parties, picnics, proms, festivals, carnivals, corporate events and holiday shows. 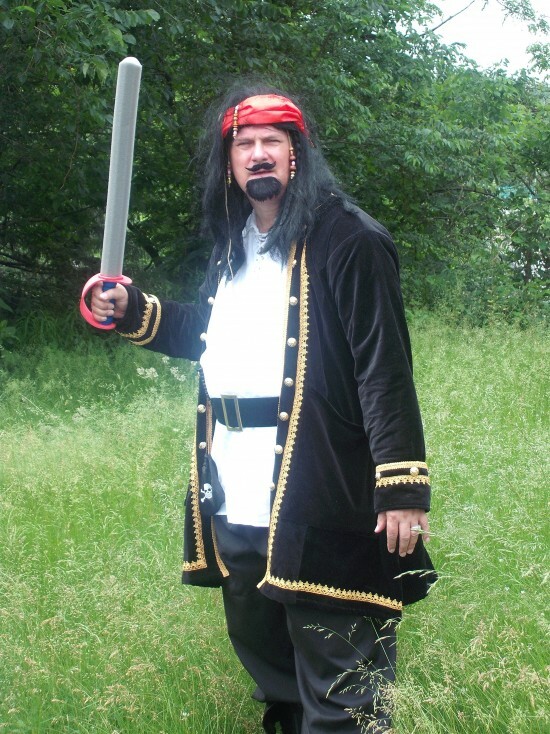 Special props and routines for pirate-themed, Halloween, Christmas, Easter and patriotic events. Stage, platform or closeup magic. Balloon twisting also available. Over 30 years experience. Pittsburgh's Premiere Quality Magician! Ray was a great performer for our Easter Egg Hunt! He was great entertainment,, and the kids were all enthralled by his jokes and his magic. Would definitely recommend! I can't thank Ray Lucas enough for providing great family entertainment for us at our Annual Light Up Night. Ray was very interactive with the kids which kept them very interested. His magic and routine were outstanding and by the look on all the kids faces they enjoyed him very much. Ray was very easy to work with and accommodating. He provided a great stage show which incorporated the magic of the Christmas Season. I would strongly recommend Ray to anyone looking for an event. Look forward to working with Ray on some future events. Ray has great communication, punctual, involves the audience and provides a funny and entertaining show. Mr. Lucas was our magician for our daughters 6th birthday party. We had about 10 kids there ages 3-8. The kids AND adults loved him! His illusions were fun and he had tons of audience participation. We will definitely be recommending him to anyone looking for a children's party magician. On time, professional, comedic, engaging, I have nothing but good things to say about Ray. Not only did the kids enjoy the show, the adults were glued to the performance as well. I would certainly recommend Ray for anyone looking to make their party memorable! Ray was very professional. He interacted with every age group to make it special. Everybody enjoyed the show! Thanks Ray, for hosting our party. I didn't see much because I was tending to more than 120 guests, but what I did see and hear was all good. It looked like you had a GREAT audience for your show, and you really worked the crowd otherwise, walking to different tables entertaining all different guests - including one woman from Columbia who didn't really know anyone else, but you made her feel right at home. Ray was very professional. He arrived on time and entertained children and adults. He did a great job at our walk! Our event had approximately 170 guests ranging from young children to senior citizens. I received nothing but positive reviews from all our guests and our clients enjoyed the balloon creations. We needed entertainment during dinner and Ray was fantastic and came up with options for our event. I would recommend anyone to use his service and I plan on having him back in the future. Thank you, Brittany. I had a lot of fun entertaining everyone. The balloons were good option for the children (of all ages) and the magic was well received by the older guests. You are to be complimented as well for hosting such a great event. Funny, friendly and fantastic with kids and adults. We all loved him. Two thumbs up and two snaps. Thank you so much. Ray was wonderful to work with. We hosted an Open House event on our campus and Ray strolled through the event creating balloons for children and occasionally doing some magic. He was easy and timely to communicate with prior to the event. He arrived on time and required little preparation. The kids who received his balloons were thrilled and everyone who got to see his magic enjoyed it. We would love to have him back for another event. Ray brought an aura of humor and magic to my wife's 75th birthday party. A crowd of 40, ranging in age from 12 to 86 were enthralled with Ray's table-by-table close up magic as well as his formal show. Fun, entertaining and memorable, he left an indelible mark on each attendee when rfemembering my wife and her family. Well done! Thanks, Richard. Everyone there was so warm and friendly making it so much easier to entertain them. Once, again, Happy Birthday to your lovely wife, Kay, and many many more. Great people and a fun time! Ray did balloon animals and a magic show at our company holiday party. His sound system went out during the show but the kids were all sitting at the stage so they didn't seem to mind. The children really enjoy the show! I think he did a wonderful job. Mr. Lucas kept in good contact before the event. Showed up early to set-up and needed little from me or my company. Was very flexible about the start time availability. Did a great job of entertaining our children (and the adults too!) He was very funny! We would use his services again in a heartbeat if the need arises. I recently had Ray Lucas for my daughter's 4th Birthday Party. I chose Ray after talking to a number of other magicians and I now know that was the best choice. From my initial contact with him to the end of his show, Ray was the ultimate professional. The kids (and the adults) thoroughly enjoyed his magic tricks. The balloon animals were also a big hit for the kids. I would highly recommend Magic of Ray Lucas for your next event!!! From my very first contact with Ray through the end of my daughter's 8th birthday party, Ray conducted himself as a true professional both as a business man and as an entertainer. Prior to the birthday party, Ray, the business man, made sure that things were progressing smoothly from our initial contact until the actual day of the party and he and I were in contact both by phone and by e-mail on a regular basis. He even showed up early to make sure everything was ready to go for his performance and that there would be no surprises that might put a damper on the event. And once he began his act, the true magic began. Throughout his show, he made my daughter feel like the special birthday girl that she was, while at the same time, he also made sure to keep all the other girls engaged and enthralled by his sleight of hand and humorous patter. Quite a trick, in itself. since he had 24 8&9 year old girls who were on a sugar high to keep entertained for an hour which he succeeded to do, hands down. As a result our party was a huge success. In fact, my daughter proclaimed that it was the best party ever! I would not hesitate recommending him to anyone looking for a magician to perform at any type of function but I was especially impressed with the way he worked with the children. I hired Mr. Lucas for my daughter 1st birthday party and he was amazing. He kept the entire audience attention with his tricks and comedic timing. Afterwards he made all the children really cool balloon animals. I would hire him again with no hesitation! I hired Ray for my daughters 7th birthday party. He was punctual (actually arriving early because we had bad weather, and he didn't want to be late). The group consisted of mostly 7 year olds and their parents. The show he put on was great, for children and parents alike! He kept the kids enthralled throughout the entire performance. Everybody was really impressed with him. We had a minor situation where one of the kids was cranky during the show, and Ray handled the situation very well. Very professional, I would definitely recommend him to anyone looking for entertainment for a party. A great entertainer for our Christmas Party! We had family and friends (children and adults), attend our Christmas Party at our home and Ray did an outstanding job entertaining them all! We received many compliments as to what a great job he did and we would definitely recommend him for any event. We loved that he not only put on a magic show but then spent time with the kids doing balloon animals and then walked around and performed small group magic tricks for the adults. A fun time for all! Great entertainment for our son's birthday party!! Mr. Lucas was entertainment for our son's 1st bday party. Besides the bday boy, ages of the children were 2- 11 & they LOVED the magic show! They sat & watched the whole show! The balloons were also a big hit! The adults enjoyed the show too. I would recommend Mr. Ray Lucas to anyone looking for a magical way to entertain kids! Excellent entertainer. Professional. Funny. Had the children (4-10 yrs. old) involved with a trick the whole time. Even had a husband and wife couple help. The adults enjoyed the show as well. He geared this for the younger crowd. Balloonist as well. They really liked Ray and the parents enjoyed watching the kids excited. Definitely would recommend. We were at the Merry-Go-Round in Schenley Park when Ray started to perform. He held all the kids attention and had great routines for the Halloween season. I talked to him afterwards and we booked him for a Christmas party. He also performed two more shows with completely different tricks and routines that day. The kids were all entertained. I think he did a good job. No matter what age group he performs for, the entertainment is fun-filled with lots of audience participation. Items appear, disappear and change right before your eyes. Special magical production for the birthday child. Member of International Brotherhood of Magicians, Society of American Magicians, International Magicians Society. Over 30 years experience. 4 time winner of Pittsburgh's Magician of the Year! $1 million dollar liability insurance coverage! No event is too small or too large. Special gift magically produced for the birthday child! Special routines and props for Halloween, Christmas holidays, Easter, patriotic events. 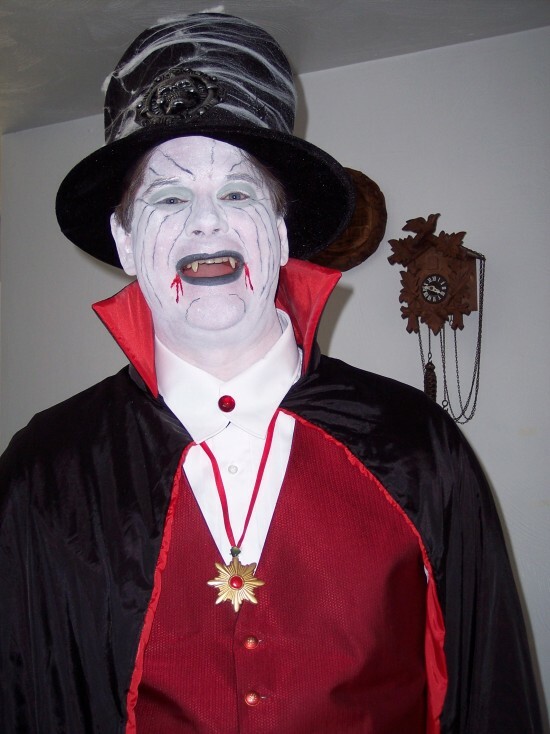 Also can appear as a Halloween vampire, clown, Santa's cousin or pirate in full costume with special props. Balloon twisting also available. Stage, platform and closeup magic designed in good family-oriented taste. Sorry, I do not face paint. $1 million dollar liability coverage. 4 time winner of Pittsburgh's Magician of the Year. Over 30 years experience. Having attended numerous conventions and magic club functions, I have drawn on their expertise to design my show with comedy and magic with lots of audience participation and sight gags. Show is very adaptable to most venues and events.